Did you ever get oranges in your Christmas stocking. I remember getting them, don’t know how often, or why I remember that but maybe that was a way of filling up the stocking; who knows. Some of the most delicious oranges I have tasted were in Madrid. I’m not sure what they were called but they were candied. I attempted to make these after returning from that trip and the first time they turned out great (Second time I think I burned them.). These Candied Orange Quarters were the best thing I ever tasted. Ya know those little sugared orange slices you get in a bag for $1, well those are my husband’s favorite candy, but the candied ones were 1,000 times better than those and he loved them. This is such a simple salad I’m almost embarrassed to tell you about it. One day I was thinking of how good oranges are this time of the year and had an idea for doing a fruit salad that would be all orange in color. I guess that could have been cantaloupe, oranges, mango, maybe some really dark pineapple. 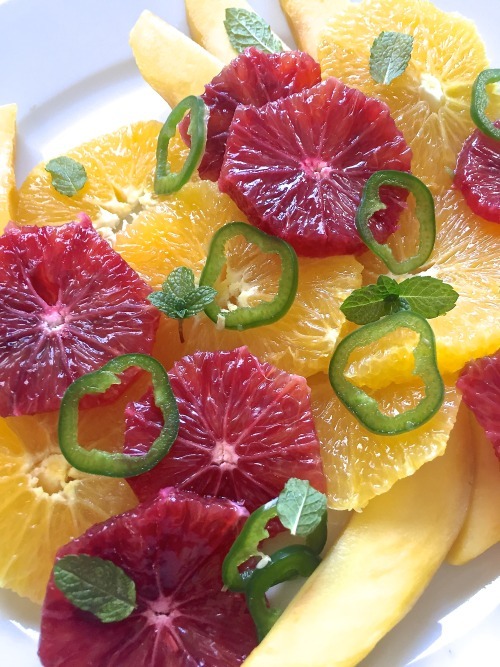 Well, once I came across the blood oranges I had a lightening bolt of an idea and that was to mix the BLOOD orange with the oranges to make a beautiful and tasty salad. I love the contrast of color in this salad. Blood oranges are grown world-wide but mostly in Spain and Italy. I’m not sure where mine came from but I love finding them in the orange sections different times of the year and I may buy some and try the candied ones; now wouldn’t those be beautiful. BLAST FROM THE PAST: Before the warm weather arrives, you still have time to try this Very Good Cassoulet recipe. Lots of ingredients and steps but well worth every one of them. Naval orange on left, blood orange on right. 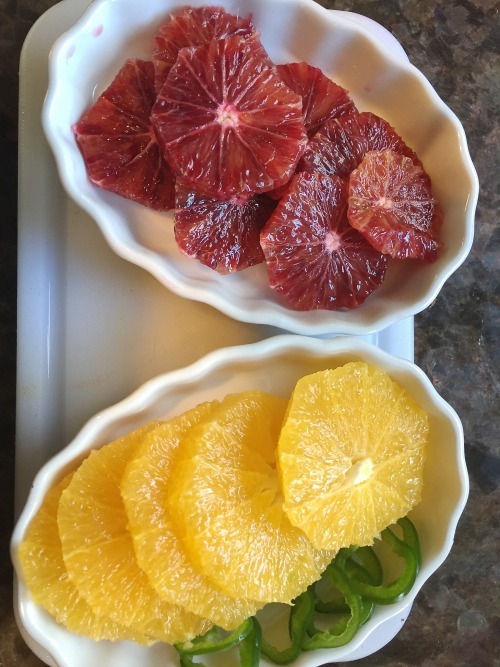 The blood orange usually will have some dark red on the outside. Oranges are easy to peel; cut off the top and bottom and then using a sharp knife cut down the sides trying to take all the peel and pith. I only used one of each orange and there was probably enough for four people. 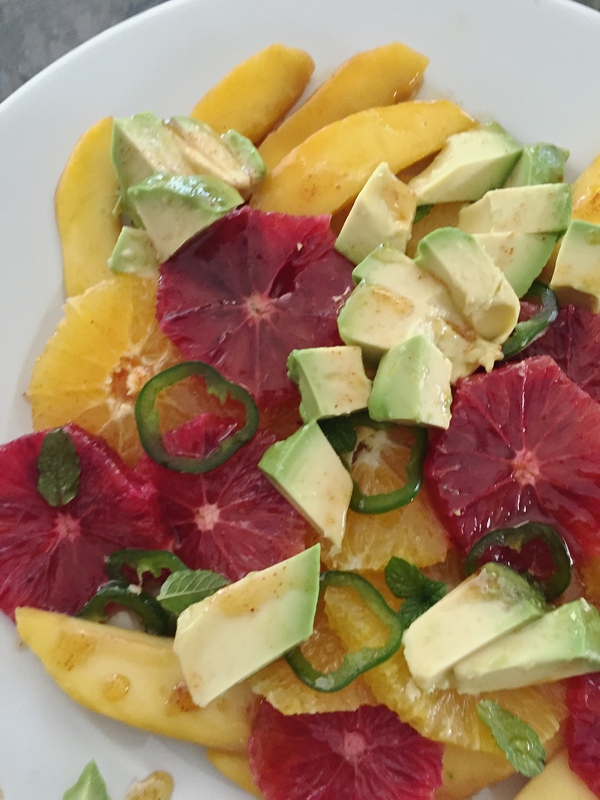 Arrange the oranges on a plate, then add the mango, jalapeño and mint leaves. Drizzle the salad with some of the dressing. 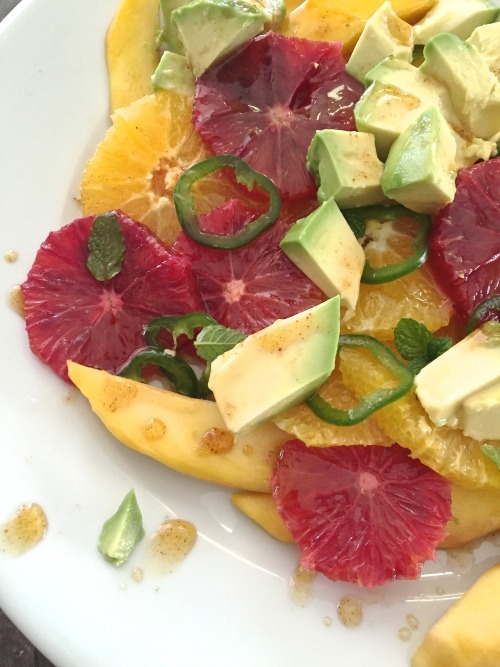 Blood orange makes a beautiful salad and add in some mango and avocado and you will be pleased with the results. Whisk the honey, vinegar, oil, cayenne (optional), and cinnamon together and set aside until ready to dress the salad. 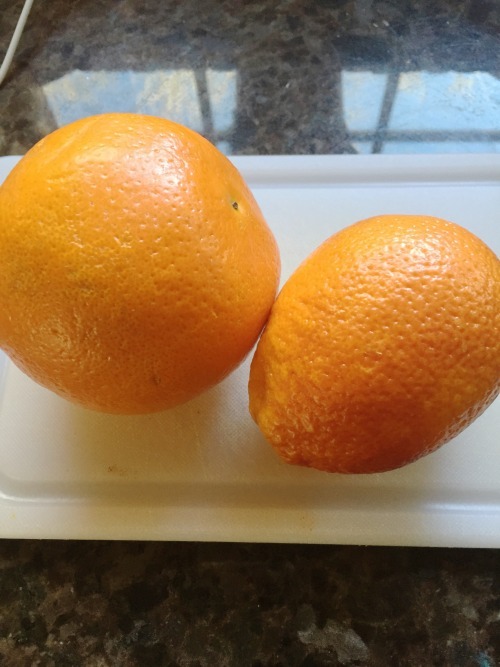 Remove the peel from the oranges and slice into 1/4" slices. Arrange on platter. Peel the mango and slice or cube and add that to the platter of oranges. Sprinkle with some mint leaves and the sliced jalapeño. Drizzle with the dressing. 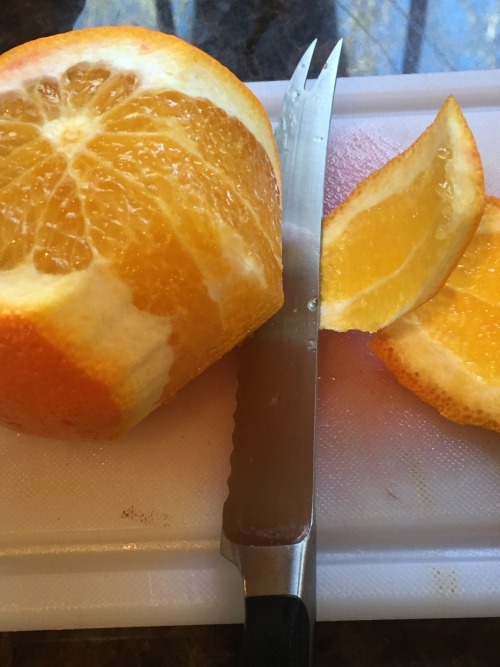 Cut the top and bottom off of the oranges and then use your knife to go down the sides to remove peel trying not to take any of the orange with the peel. Slice oranges and set aside. Slice the mango into thin strips. 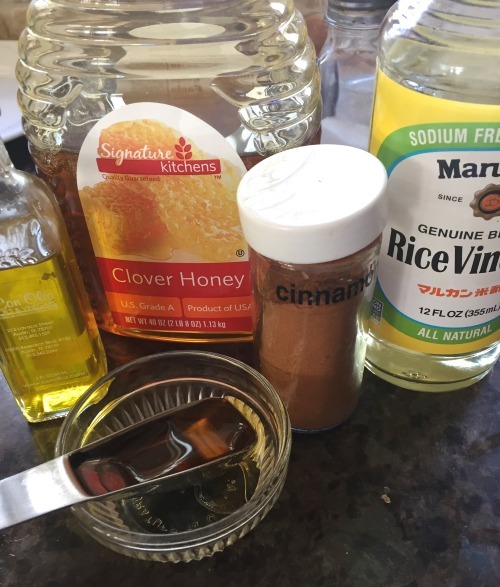 Mix the honey, vinegar, oil, cayenne pepper and cinnamon until blended. 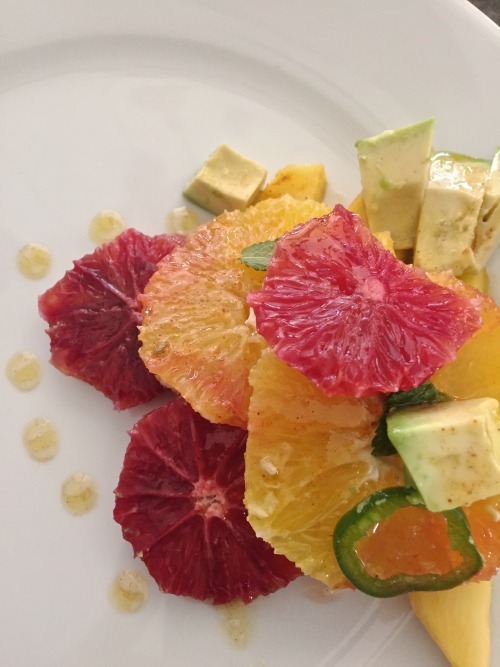 To plate, arrange the oranges and avocado on a salad plate. Zest the lime over the top of the fruit. Drizzle with the honey mixture, sprinkle with cinnamon and garnish with chopped mint. I think very thinly sliced golden beets would be wonderful in this salad. I just didn't have any when I made this.